One of the factors that can either determine the success of a camping trip is a tent. However, choosing a tent can be a significant investment both in time and money. With so many shapes, types, sizes, and features, picking one that best suits you can prove daunting. As it is often the case that a camper picks the wrong choice, this Ozark Trail tents review has gone through some of the best Ozark Trail tents. These reviewed tents vary, and a camper can choose out of any of these designs. Why You Should Consider Ozark? 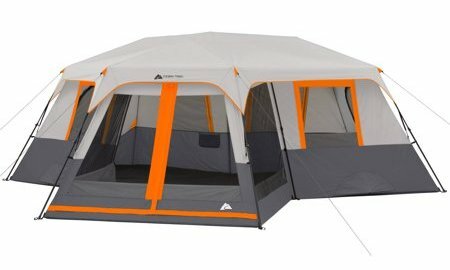 Floor Dimension: 7'8" x 4'8"
Ozark is a popular manufacturer of trail tents, and its products are of high quality. Firstly, campers can zero down on a particular tent owing to the brand name of Ozark as they can rest assured that they’ll be getting good quality. 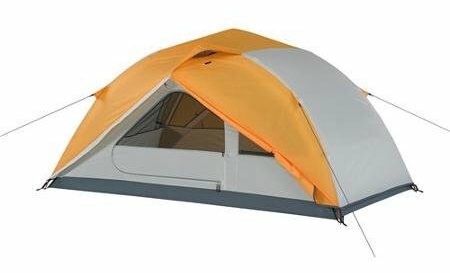 These Ozark Trail tents are also cheaper than most on the markets, considering their features. Most of these tents are made of quality material such as nylon or polyester. Though Ozark tents are not designed for those who want to take camping trips that last for months, they are a practical and excellent solution for those who want to enjoy a great time camping outdoors or backpacking. With the Ozark Trail 4-Season 2-Person Hiker Tent, you can begin to prepare for a fun-filled camping adventure. 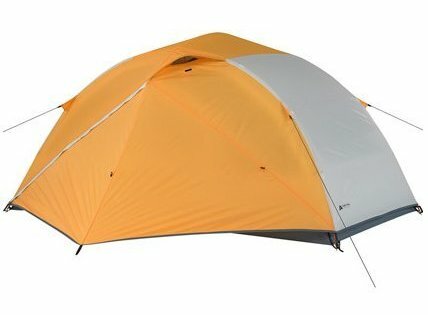 This hiker tent is especially useful if you are backpacking alone or if you have just one partner. This 2-Person Tent is lightweight, and as a result, you can walk around easily with it. Moreover, easy access for two hikers is guaranteed because of the front and rear doors of this tent. Stargazing on clear nights is also enabled with this hiker tent. 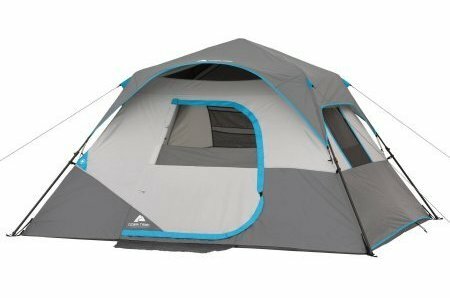 This Ozark Tent is a must-have as it is suitable for hiking, backpacking, and overnight adventures outdoors. 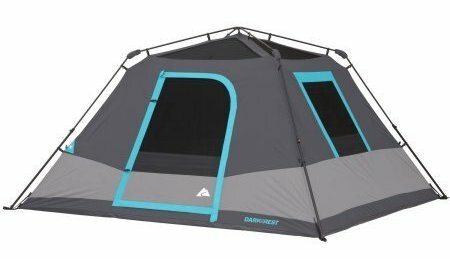 This Ozark Trail 6-Person Instant Cabin tent is a free-standing camping tent with an innovative darkroom technology. This new technology blocks sunlight and enables a more cooling tent during the day. You can set it up in just sixty seconds. Also, no assembly whatsoever is required because the poles are already attached to the tent. All that you need is to unfold and spread the tent. You can customize the lighting of the tent, or it can be rolled back for stargazing. 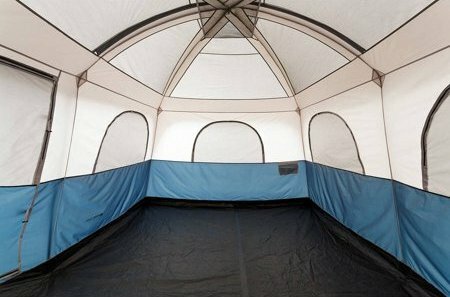 This tent features three large windows that allow a good view of the outside. This instant cabin tent easily fits in six campers in sleeping bags on the floor or double queen-sized airbeds. 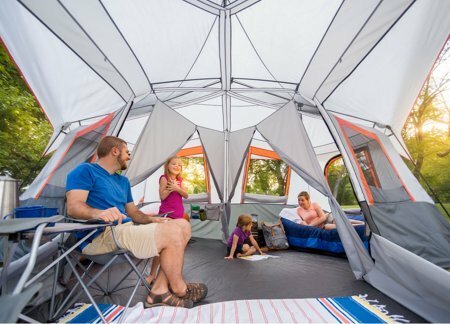 This Ozark Trail Instant Cabin Tent is a 6-Person tent, and this makes it big enough to suit the camping needs of most families. It is also effortless to set up in less than a minute. It has a spacious interior that will fit in two queen-sized airbeds. Furthermore, the three windows also ensure adequate ventilation and light. If you are a stargazer, you’ll be happy to note that the flysheet can be removed while the mesh sheet protects you from insects. 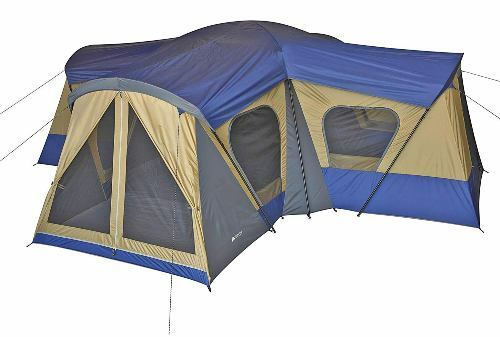 The Ozark Trail tent 10-person Instant Cabin Rest is a self-supporting family camping tent that is manufactured from a line of tents equipped with the dark rest technology. As a result of this technology, the harsh glare of the sun during the day is drastically reduced. Just like most Ozark Trail instant tents, no assembly is required as the poles are already attached to the tent. In short, setting up takes only two minutes. Its floor easily fits in 10 persons in sleeping bags or two queen-sized airbeds. The tent can be divided into two detached living spaces. 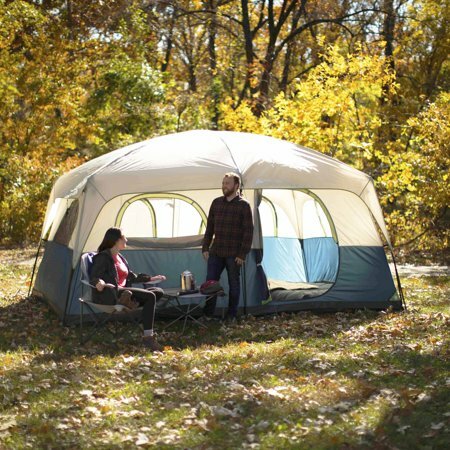 This is an Ozark Trail Tent, and like most of Ozark large tents, it is airy, roomy and attractive. 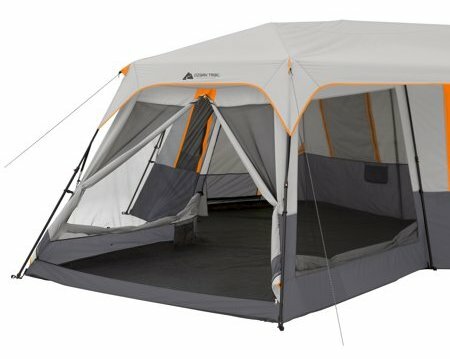 Thanks to the pre-attached poles that come with this Ozark 12 person instant tent, setting up this tent takes just two minutes. Just unfold and spread it out for use. This tent further adds to an exciting camping experience for you, your friends and family. Fitting in 12 campers or 3 queen airbeds is sufficient. Up to three separate living spaces can be created with the room dividers. On all sides of this cabin tent, there are large windows, and it has a front awning that allows relaxing. This 14’ x 10’ cabin Ozark trail tent has plenty of rooms for a whole family to enjoy a camping trip comfortably. It features two rooms that are divided by a single room divider. That is, the sleeping and living spaces are separated with large windows everywhere. 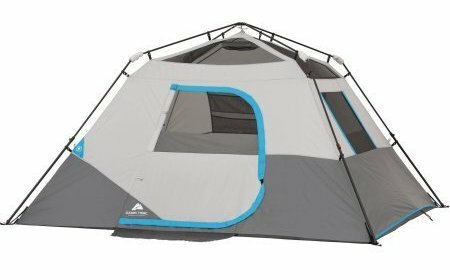 The center height of this tent gives enough room for movement. It can easily fit into 10 sleeping bags or two queen-sized beds. Transportation of the tent and its storage when not in use is made easy by an included carry bag. 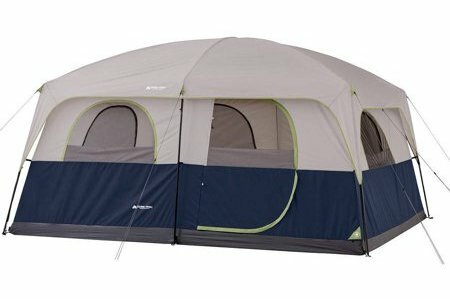 This tent is ideal for groups or families who enjoy spending quality time outdoors while still enjoying all the comforts of home. This Ozark Trail Base Camp is one of the largest camping tents on the market. It has four separate rooms as well as 12 windows. It is the ultimate Ozark cabin-type tent for people, numbering up to 14 who are interested in camping. When viewed from above, this base camp has the form of a plus sign or a large cross. It has a central common space with vestibules that can be divided into separate living means by three included room dividers. This tent has excellent ventilation and visibility with a mesh roof that keeps all insects and mosquitoes at bay. Moreover, there are access points for all campers through which they can move in and out without troubling others. Size is an essential factor in choosing a tent. 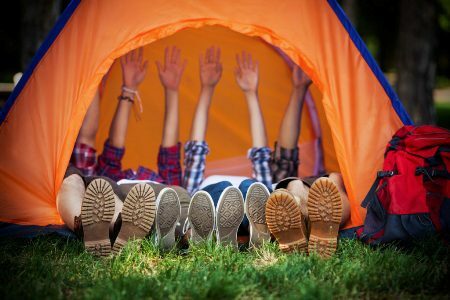 Whether you are going for a simple hiking trip, a couple of camping retreat or a mass family camping outing, the size of your tent has a significant impact on the outcome of the trip. Learn more from this article. Tent sizes are usually measured in ‘-person’. As being suggested, a 2-person tent theoretically equals a 2-person sleeping capacity. However, the comfort of 2 people in a 2-person tent is not guaranteed as they might end up in a tight squeeze. So, it is better you consider upgrading by one or two sizes to get extra space. The only exceptions are solo backpackers that travel very light where either a 1-person or 2-person tent is sufficient. If you are tall or a tall person is included in your group, you should look for a tent with a high center height. Furthermore, if you are like 6 feet tall or above, you should consider tents that measure up to 90 inches. You should also decide between a cabin-type tent and a dome style tent. The latter has more strength and better abilities for wind-shedding. These dome-styled tents are best appreciated during stormy nights. On the other hand, the cabin-styled tents feature walls that are almost vertical, maximizing living space and overall tent peak height. These tents have models that include family-appealing features such as awnings, room dividers, and vestibules. So, you should decide between the cabin tents which maximizes living spaces and the dome tents which are stronger but with a slope that reduces living space. 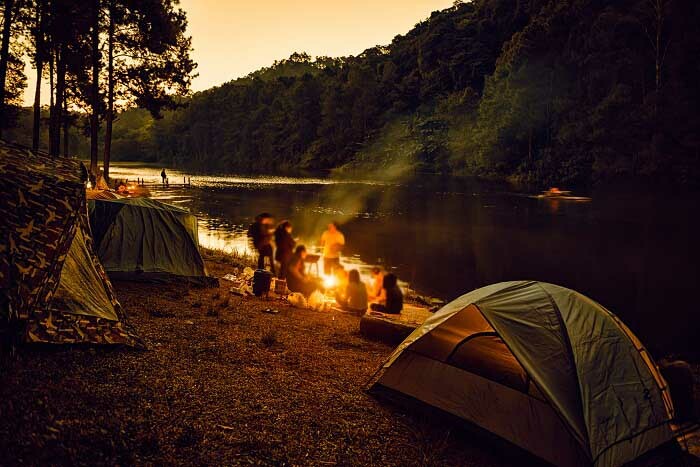 Are you camping with family or friends? Then, you should remember that the feel of home in the tents is essential. To enhance this home feel, you must consider the number of doors that a tent has and their shapes. This is because when camping with family, multiple doors are more useful as they aid you to avoid disturbing each other over bathroom breaks in the night. That is, everyone can go and come with bothering others. The structure of the tent poles helps to determine just how simple or hard it will be to pitch it. Most family tents in recent times are freestanding. The advantage of this form of tents is that they can easily be transported to another location before staking. You can shake and remove dirt from it before setting it or taking it down. Moreover, the fewer the poles, the faster it is to set the tent. Attaching poles to clips is also an easier task than attaching them to pole clips. 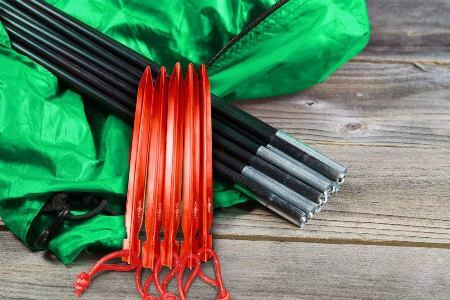 Several tents now make use of both pole sleeves and clips to ensure balanced strength, setup ease, and more ventilation. Furthermore, aluminum poles are considered more durable and stronger than those made of fiberglass. This is very crucial in choosing any tent. 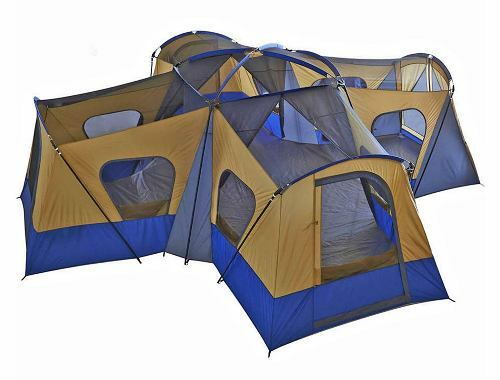 If the tent is to be used for a group or family, then it is better you go for tents with more windows. Also, mesh panels are utilized in the windows, ceiling, and doors of tents. But for hot climates, try to get tents with bigger mesh panels. This is a factor that is wrongly overlooked by campers. However, there are different tent materials, and the fabric can define the tent that most suits you. This is because the fabric influences water resistance, insulation and the breathability inside the tent. The commonly used fabrics are cotton, nylon, and polyester. Though cotton enhances superb breathability and keeps the tent warm during cold weather, is still has a weight disadvantage. Nylon is breathable, lightweight and excellently waterproof but its drawback is that its waterproof coating starts to wear off over time. Though polyester is quite similar to nylon in the sense that it is breathable and water-resistant. However, it is more durable and can better withstand sunlight. You should choose a tent that you will be able to set up. The last thing any camper wants is to spend hours trying to figure out how to set a tent. When you go tent shopping, try to see if an assistant can show you how to set it up and also gauge the time required for setup. You can also try to get a manual that can put you through the step-by-step process of setting the tent. A rainfly is a waterproof cover designed separately for the roof of the tent. You should use it when rain is imminent, or you want to retain more warmth in the tent. The two common rain-flies are – full coverage rainfly and roof-only. The latter permits more light into the tent and also offers reasonable protection from rain while full coverage rainfly provides peak protection from wind and rain. It is important to always clean and wash your camping tent after each used to ensure the functionality and durabillity. You may look up articles and videos online for references. These Ozark Trail tents are manufactured with good features, and so choosing can be a bit difficult. Thus, the question of which is the best among the 7 Tents arise. 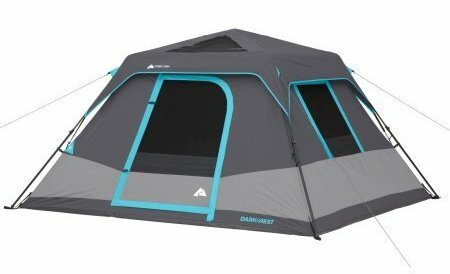 The Ozark Trail 4-Season 2-Person Tent is perfect for one or two person hiking or backpacking trip. It is also lightweight, and it can be moved around easily. 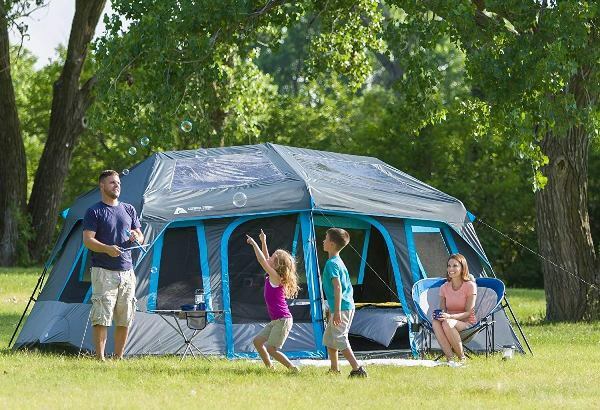 The 6-Person tent is excellent for families between the size of 4-6. It goes up easily, and it fares well in severe weather. 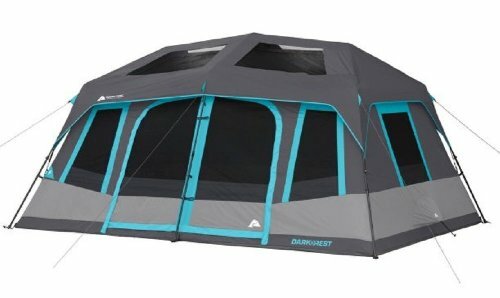 Average families will enjoy the Ozark Trail Tent 6-Person Dark Rest which has excellent lighting, ventilation, and a large mesh panel. 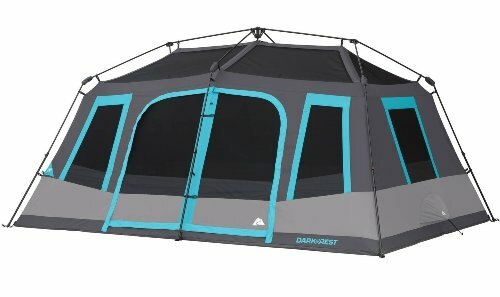 Most reviews praise this tent because it features an innovative Dark Rest technology to help block away sunlight, makes the interior stays cool, which is perfect to be used during summertime. If you are going after the same technology but looking to accommodate more people, the 10-Person Dark Rest is a good choice. Furthermore, the 12-person with 3-room is highly suitable for families of up to 12 that want to enjoy an outdoor camping vacation. The Family Cabin Tent is huge while still easy to transport and store. The Ozark Base Camp is by far the largest of the reviewed seven as it accommodates up to 14 people. All the Ozark tents in this Ozark trail tents review have something wonderful to offer, and the best is that which most suits your needs.